Charlotte has a thing for cats. She loooves our cat Luna (too much sometimes), and has quite the collection of kitty shirts, leggings, pillow, shoes, etc! 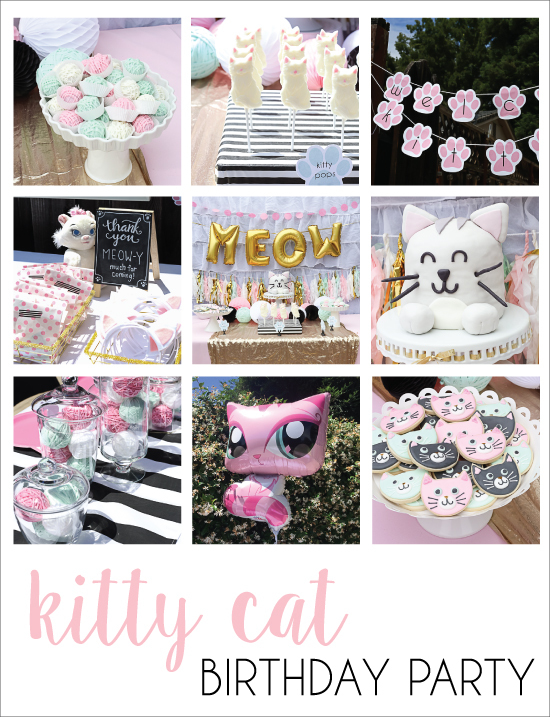 So she’s had the theme picked out for her 6th birthday party since pretty much her 5th birthday. lol! We chose a pink, mint, black&white, and gold color scheme and started planning! 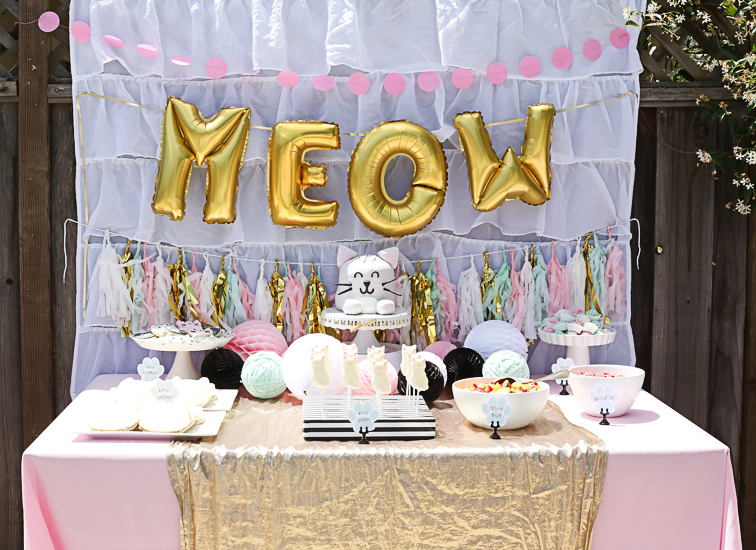 It turned out so cute and she told me it was the BEST PARTY EVER mom! Affiliate links are scattered throughout-thanks! 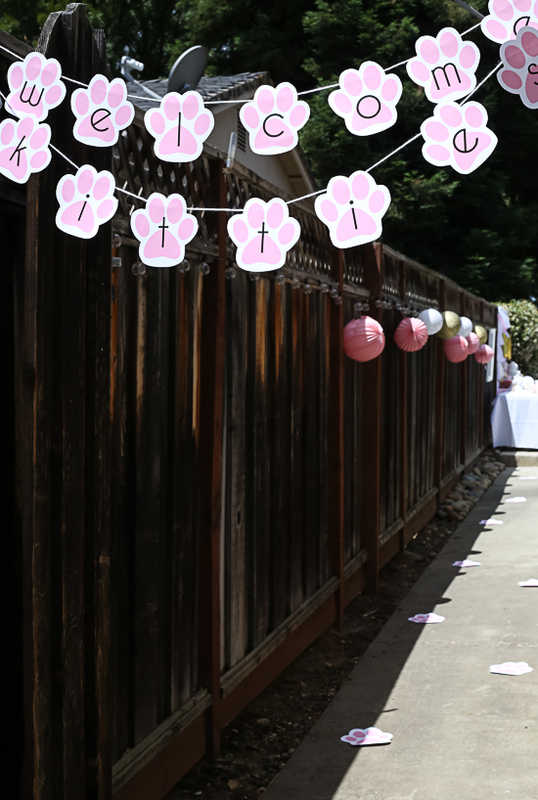 We welcomed her kitty friends with a paw print banner and paw prints headed down the side yard, along with some paper lanterns. I gathered my glass containers and filled them with Styrofoam balls wrapped in yarn, hehe! The mint I used strips of knit fabric because I forgot to grab that color yarn and I was not about to head back out with all four kids for some yarn. ha! 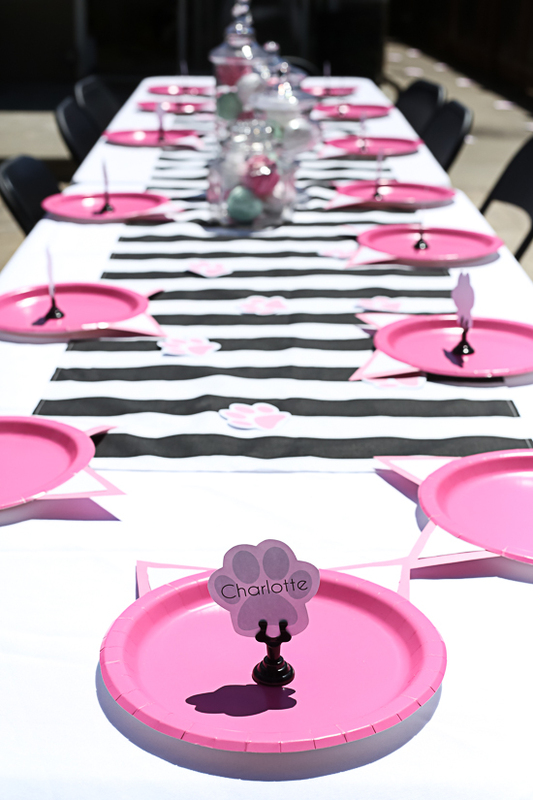 The two older girls had a good time helping me cut out and glue kitty ears to some paper plates! SO cute! I use these black card holders all. the. time. 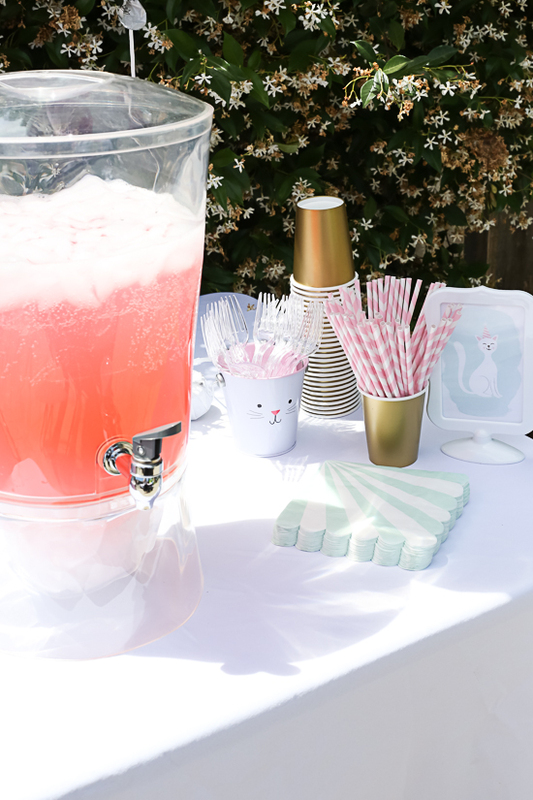 for parties! love them! 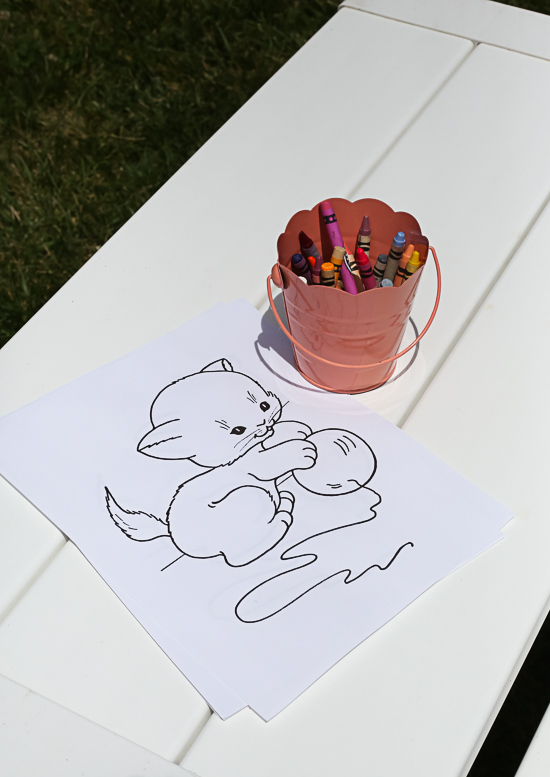 I set out some kitty coloring pages and crayons-this is always a hit at parties! 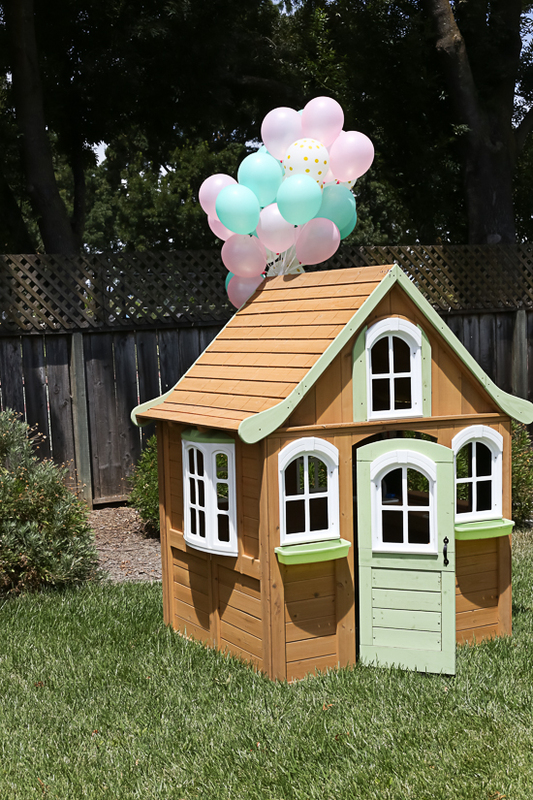 Blew up some mint, pink, and gold dot balloons and attached them to our new playhouse… we all started thinking we should have an UP party someday and do this in a fuller scale!! 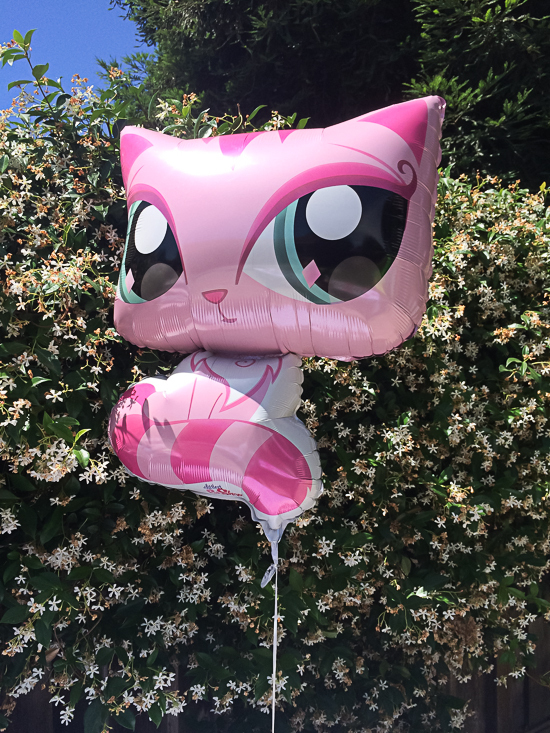 I ordered this sweet kitty balloon and it’s being dragged around the house now as the new balloon pet. haha! 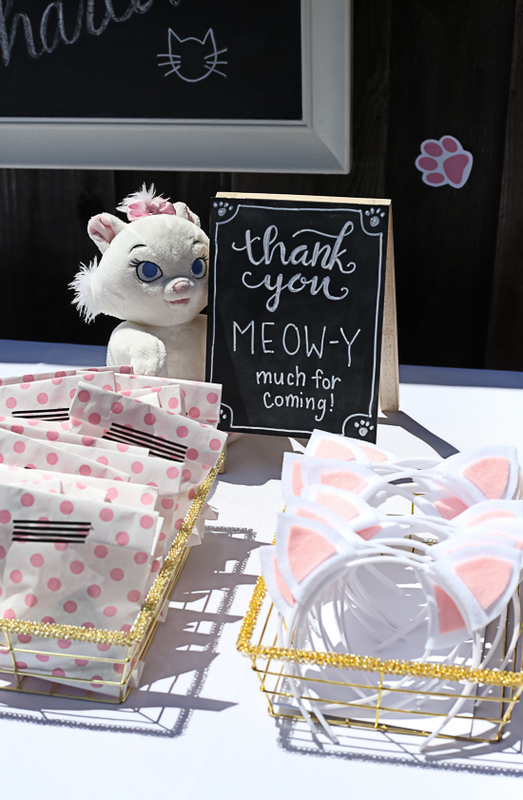 For favors, I made kitty ears out of white headbands and craft felt. (template coming!) I made the cute chalkboard sign from a chalkboard I got at the Target dollar section, but alas, the chalkboard pen doesn’t come off. hmm. 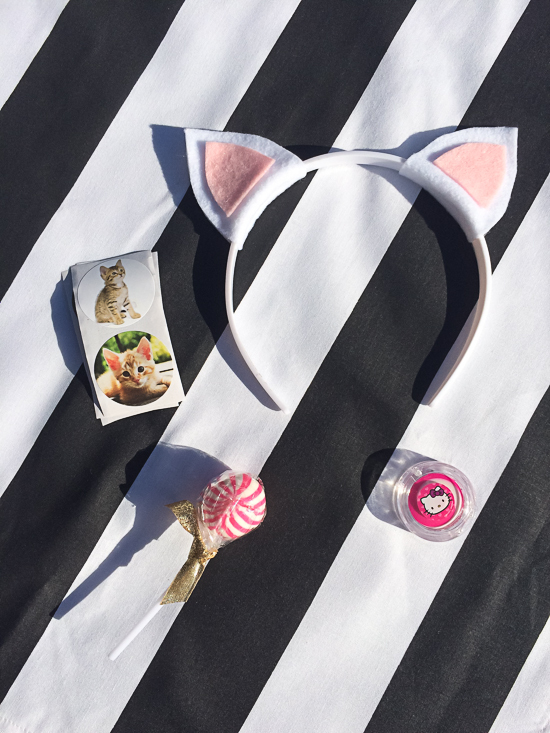 I packaged up in some little paper bags, a lolly (that I thought looked like a yarn ball), a hello kitty lip gloss, and some kitty stickers! 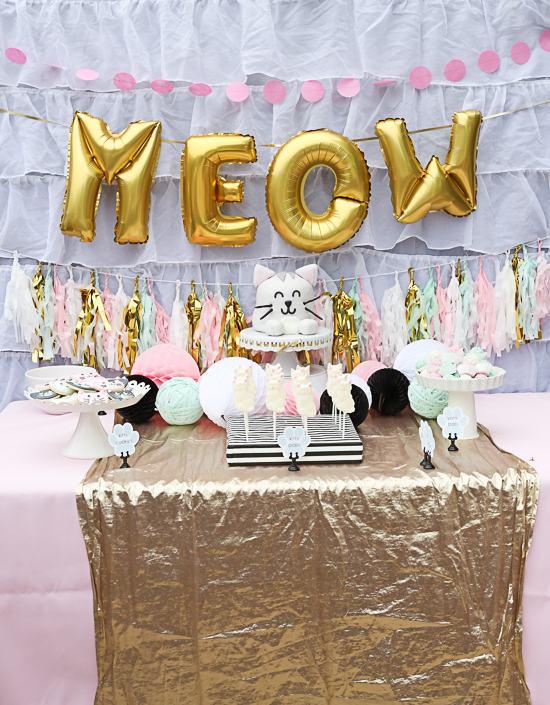 For the table, it was a few new things and a lot of reused things! My tissue tassels are still going strong from originally, my sister’s bridal shower! along with some I’ve made for various parties along the way, lol! I have quite a collection now. 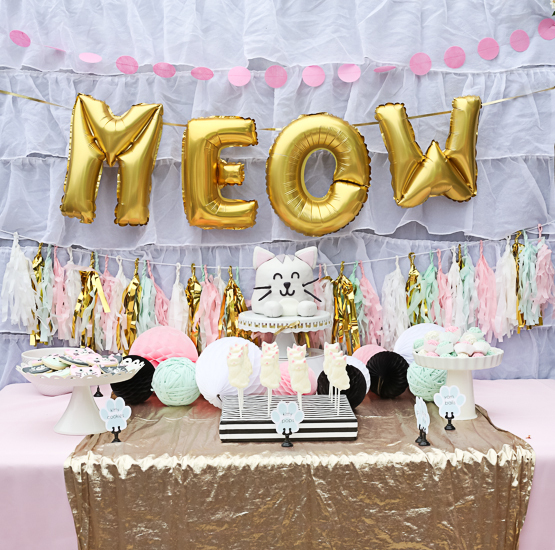 MEOW letter balloons-great quality! 3 days later and they’re still going strong, though they did show up looking slightly different than the listing. At least they didn’t pop like the gold balloons I got for Sadie’s Star Wars party! RIP. 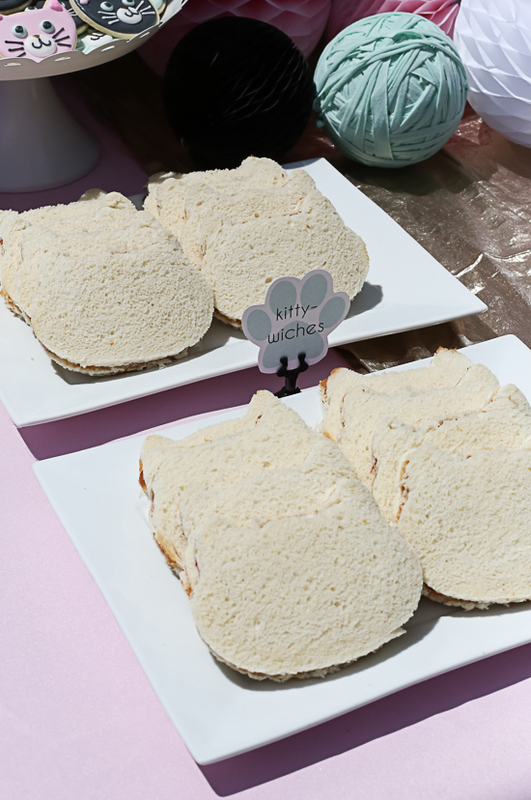 Kitty-wiches, just PB&J cut into a kitty shape with this cutter. 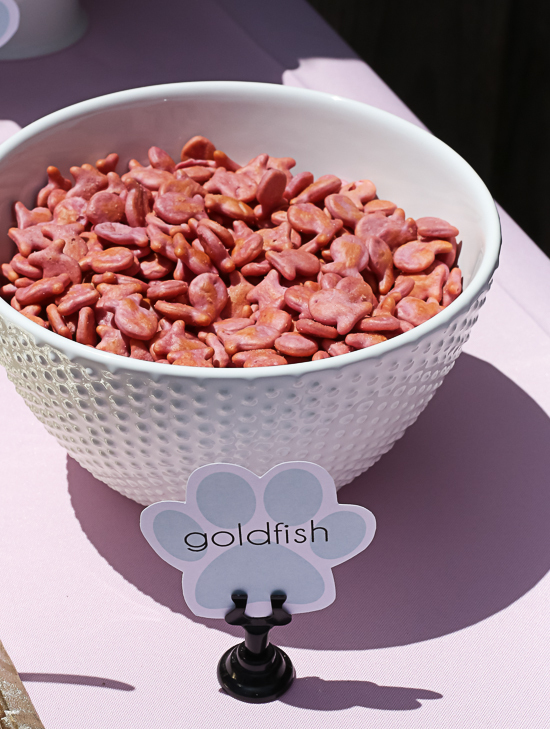 goldfish crackers, because kitties love em! 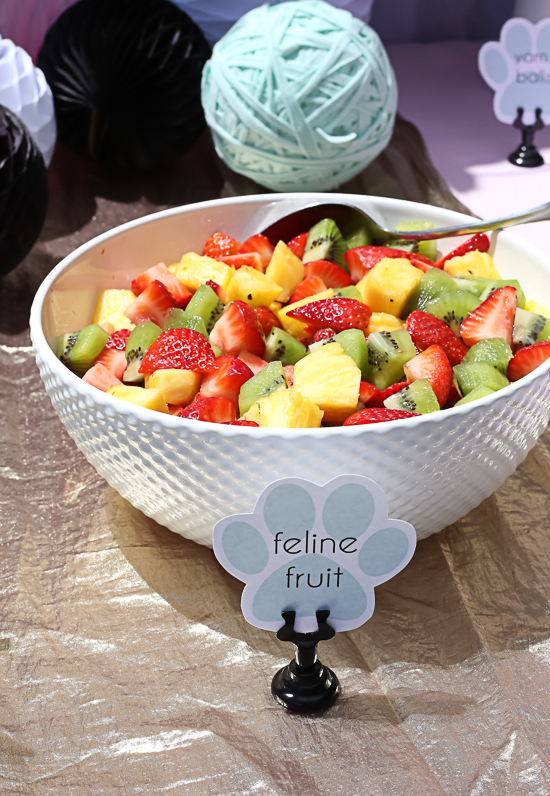 and some “feline fruit”. har har. 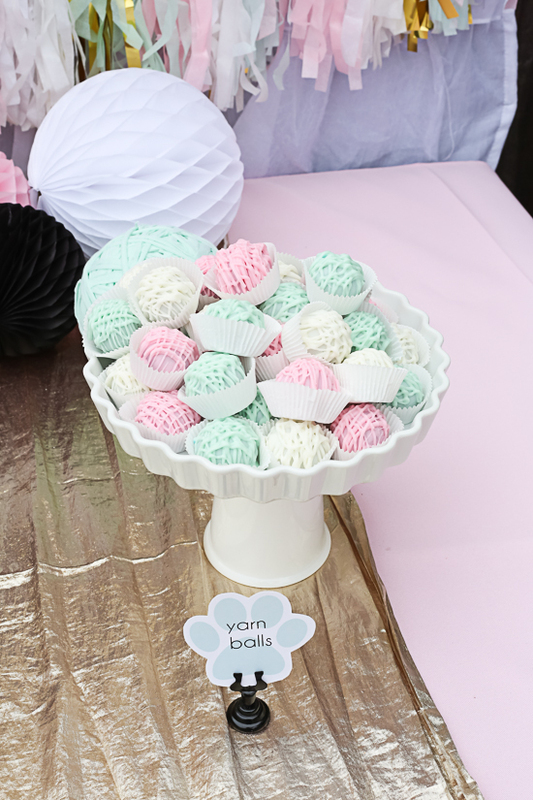 On the table, I also laid out some “yarn balls” aka honeycomb balls, they looked ADORABLE! I got various sizes of black, light pink, and white. 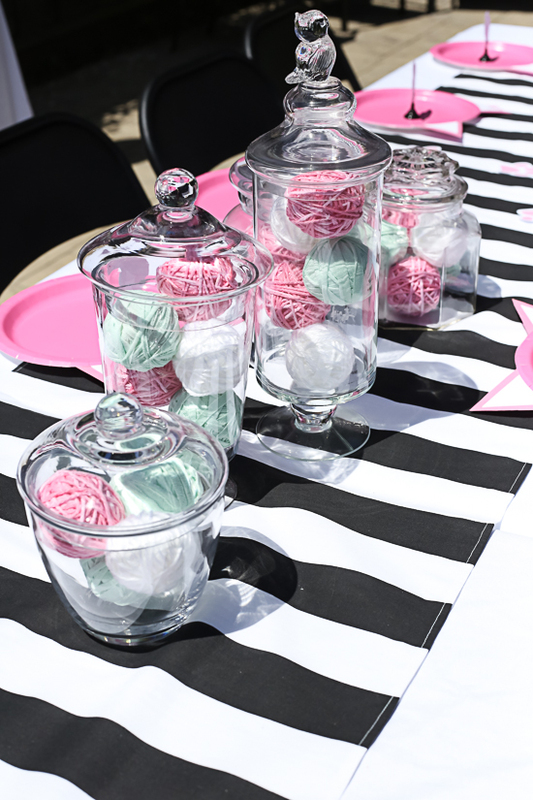 The mint balls were made with some more of the knit fabric I cut into strips, wrapped around larger Styrofoam balls. 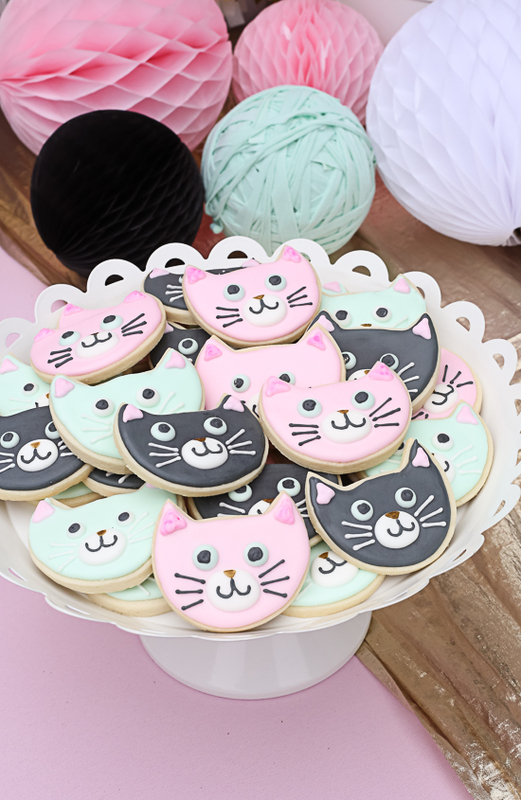 My sister kept me company while I made these cute kitty cookies and helped with the finishing touches! I love how they turned out! I made oreo truffle “yarn balls”….yum! Just dipped them and then drizzled more candy melts over the top to look like yarn. 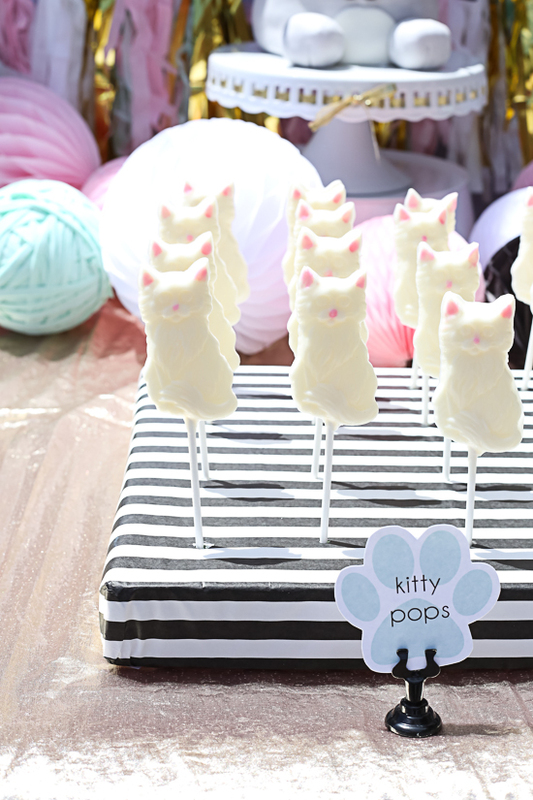 Made some candy melt kitty pops with this mold. 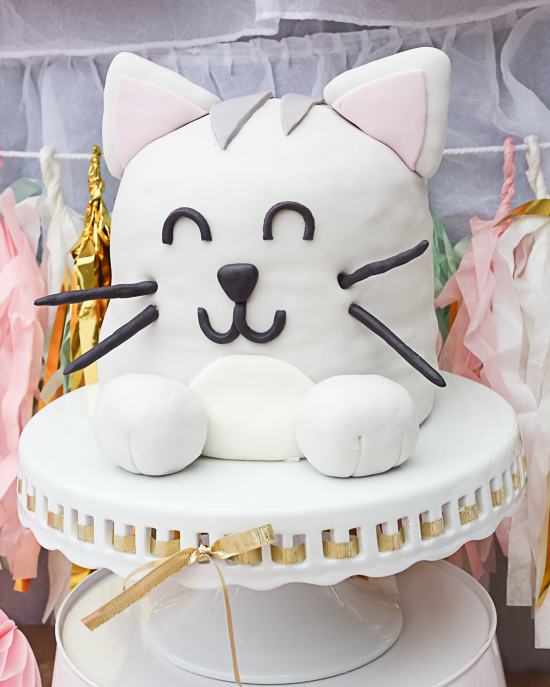 The kitty cake was based on this cake I found online-Charlotte had her heart set on it so I gave it a twirl! She’s a little poochy on the left side for some reason, I did make it the day before so i think it settled overnight. 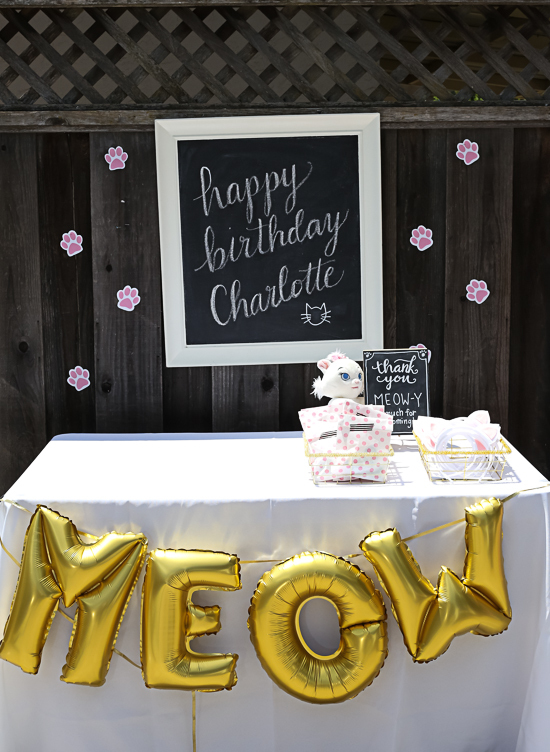 Either way, it ended up pretty darn cute and Charlotte was thrilled! 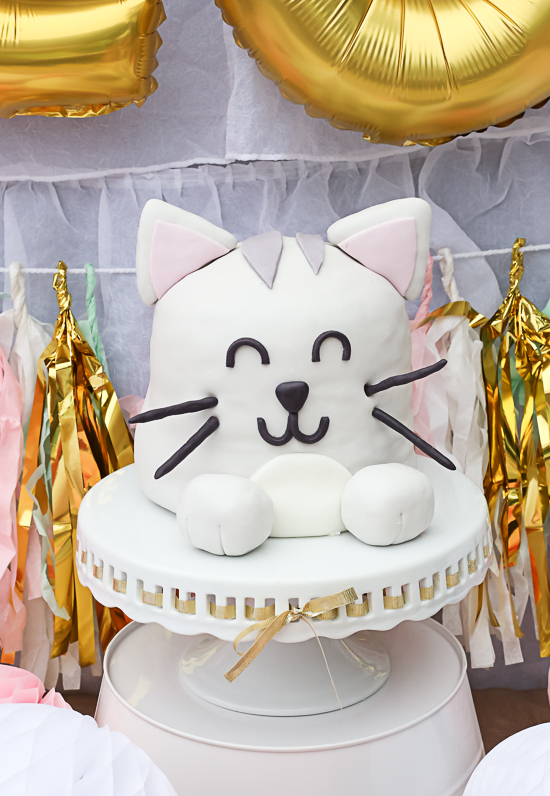 I used this awesome set of pans and made a much smaller cake than I usually do…it was kind of nice to do that! MEOW! 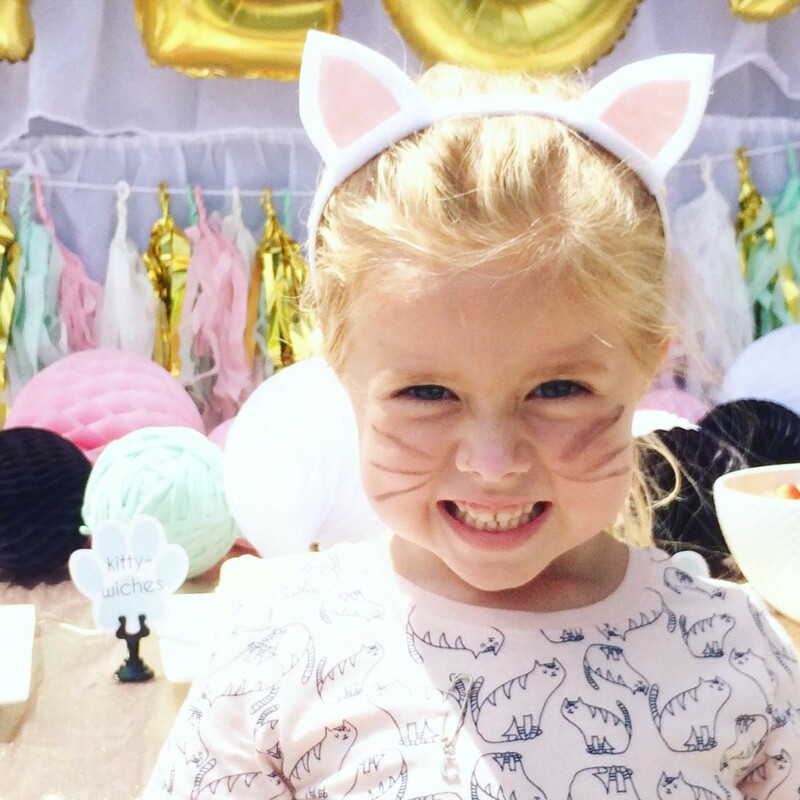 She had a blast and so did all her cute little friends! Yay for kitties! I think this one is my favorite! 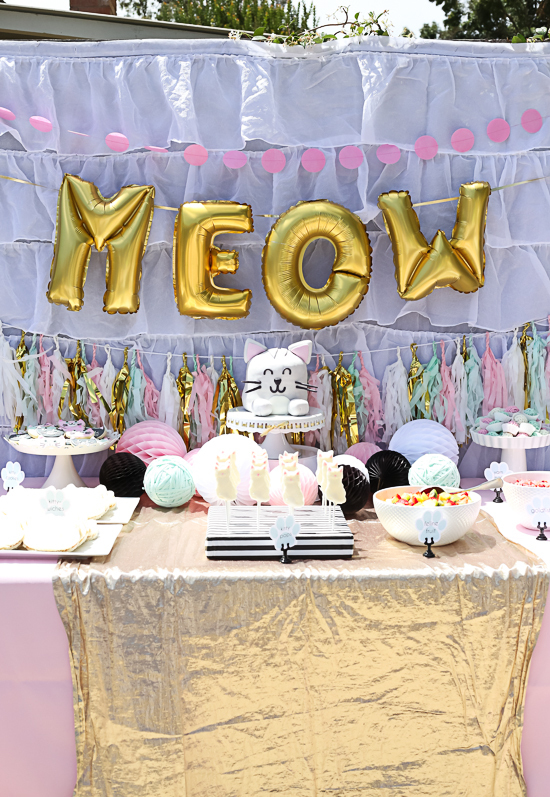 You always outdo yourself with these parties, totally adorable! Awesome party (as usual)! I had the chalk pen problem a few months ago and found that a magic eraser takes most of it off! I hope that works for you! Try magic eraser on the chalk board. 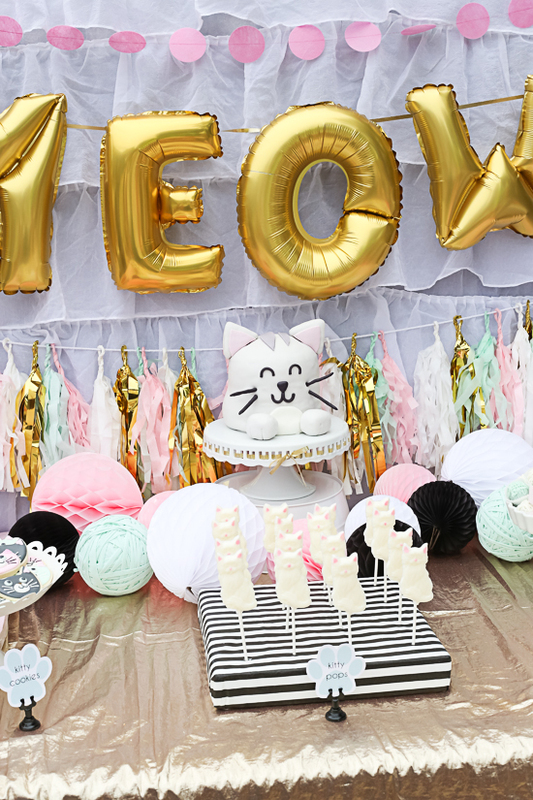 Love the party so cute! Wow! So beautiful and fun! So so cute!! You throw the best parties ? This is soo cute! Where did you get he kitty pail to hold the forks? Where did you get the cookie cutter for the cat cookies? Having trouble finding one in that size! It ended up being a custom cut-not a cookie cutter that I bought, sorry! Do you have a template you used for the car ears?